At the Cary School, we incorporate creative curriculum to empower your child to not only gain a fundamental understanding of skills and concepts crucial to educational development, but to foster a classroom for creativity and fun. We work with each child’s individual needs to ensure that learning is happening and fun is to be had, all while providing an atmosphere for growth. This is reflected in our classroom environment and design, as well as curriculum. 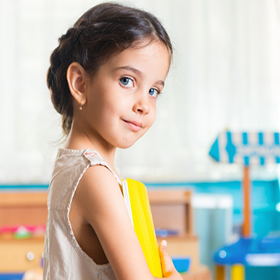 We work to provide your child with an enriching early educational experience, while also fostering the social, emotional and creative needs of a child/toddler. One of the ways we do this through our kid yoga classes, where we teach breathing techniques and methods to calm their minds and bodies. This introduction to a rewarding practice has many benefits. Let’s explore some of the many powers that kid yoga can offer to your child. Practicing yoga helps build awareness about your body and mind, and how they work together in harmony. This awareness can result in better focus, as deep breathing and movement are integral aspects in the practice of yoga. Yoga practice bridges a gap between what children hear and what they do, all while gaining awareness for their mind and body. Awareness is also built by understanding the world and people around you, something that yoga fundamentally teaches children. Though preschool may be filled with fun and engaging activities, a lot of the lessons can be difficult for preschoolers to understand. This challenge causes frustration and can lead to desires to want to give up. Yoga helps give them an outlet to this frustration, while teaching them that though there may be challenging tasks within school, you can get through them with a strong mindset and an outlet to express your frustrations. This is a very important skill to teach your child at an early age, as dealing with frustrations and difficulties is a challenge that will be faced in many different aspects of their lives. Yoga classes for kids have a variety of benefits that can enhance their day in the classroom and teach them important fundamental skills about how to handle stress and frustration. At the Cary School, we believe in fostering an atmosphere that both benefits the educational development of your child, as well as the development of crucial social and emotional skills. To learn more about us and our programs, visit our website!